Following a protracted preservation campaign, James Stirling's No 1 Poultry has been granted listed status as an "unsurpassed example of commercial postmodernism". British preservation body Historic England awarded the building, which is iconic of British postmodernism, Grade II* listing to ensure it cannot be demolished, extended or altered without special planning permission. Described by Historic England as a "highly significant late work by one of Britain's foremost post-war architects", Stirling's design features a distinctive striped facade of alternating pink and buff sandstone. A columnar clock tower and balconies project away from the wedge-shaped form, which stands beside Bank Underground Station in London's financial district. Stirling designed No 1 Poultry with Michael Wilford and Associates between 1985 and 1988. It was built between 1994 and 1998 – making it the final completed project by Stirling, who died in 1992. Stirling was knighted in recognition of his contribution to architecture just days before his death and in 1996, the RIBA renamed its Building of the Year Award the Stirling Prize after him. The project was commissioned by City Acre Property Investment Trust, a company owned by the developer and former Arts Council chair Peter Palumbo, following the rejection of an earlier design by Mies van der Rohe. Set on a wedge of land between Queen Victoria Street and Poultry in the City of London, it attracted criticism for its placement within the Bank Conservation Area – and the demolition of several Grade II-listed buildings to secure the site. The building contains shops across its ground and basement levels, with five floors of offices and a manicured roof garden and restaurant above. 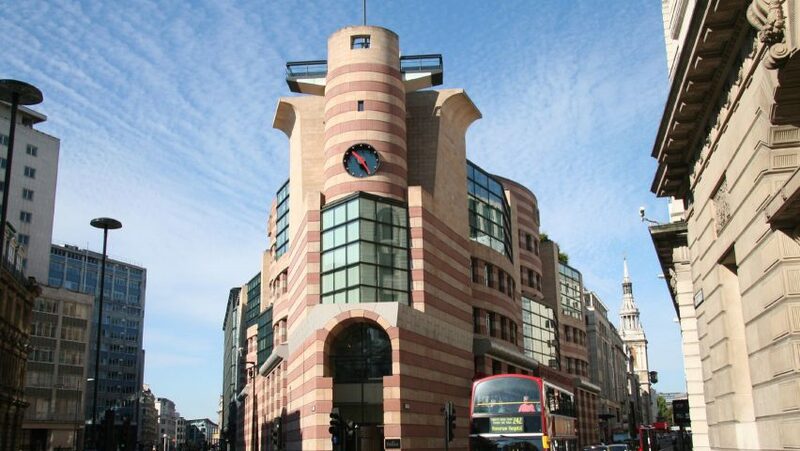 We took a more indepth look at No 1 Poultry's significance to postmodernism in our series dedicated to the architectural movement, delving into the factors that shaped Stirling's design.